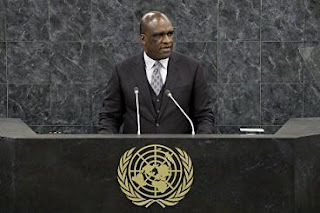 Former United Nations General Assembly President John Ashe (Pictured), accepted more than US$500,000 in bribes from a Chinese real estate mogul Ng Lap-seng and other businesspeople in exchange for help obtaining lucrative investments and government contracts, according to US federal court documents unsealed today. In exchange for the money, federal prosecutors say, Ashe used his position as Permanent Resident to the United Nations for Antigua and Barbuda and General Assembly head to introduce a UN document in support of a real estate project being developed by Macau real estate developer Ng. The scheme unfolded over the course of nearly three years, from 2011 through 2014, and included his tenure as General Assembly head, prosecutors said. Ng and his assistant, also named in the indictment, were already being held by federal authorities, accused of lying about plans for US$4.5 million in cash brought into the US over several years aboard private jets. It wasn't immediately clear if prosecutors believe any of the money was used in the Antigua bribery scheme. According to court documents, Ashe used his position to push the U.N. to promote a conference center in Macau being developed by Ng. The UN Macau Conference Center was to be Ng's legacy and would function as a sort of satellite operation for the world body, according to prosecutors. Prosecutors say some of the bribe money was used to pay for Ashe's family vacation and to construct a basketball court at his home in Dobbs Ferry, New York. He opened two bank accounts to receive the funds and then underreported his income by more than US$1.2 million, officials said. The businesspeople flew Ashe, his wife and their two children first-class to New Orleans and put the family up in an US$850-a-night hotel room. Ashe was arrested today and is being held, and his legal representation wasn't clear. 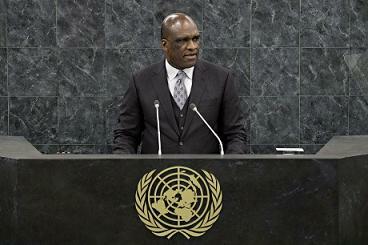 No one answered a phone call to the mission for Antigua; he is no longer listed in the UN directory. A message left with a representative for the General Assembly wasn't immediately returned. In all, six people, including another diplomat, Francis Lorenzo from the Dominican Republic, were ensnared in the probe. A message was left at Lorenzo's mission.